What Does It Mean When Procurement Goes Green? John Davies, vice president of the GreenBiz Intelligence unit, gave a report on green purchasing on GreenBiz.com last week. He writes, "Green purchasing by companies is up in a down economy. Our recent October 2009 survey of more than 450 companies found that over the past 12 months there was a 63 percent increase in green purchasing, from computers to chemicals to cleaning supplies. Perhaps even more encouraging, none of the respondents from large companies (those with revenues over $1 billion) identified any decrease in buying green. But when it comes to businesses buying green, what do they really mean?" "Large wardrobes of seldom-used clothes are no longer environmentally acceptable and people should instead rent outfits and accessories, according to the Government’s waste watchdog," reported Ben Webster of Times Online. AFP, 28 October 2009 - A Japanese sun-powered car won the World Solar Challenge on Wednesday after averaging speeds of more than 100 kilometres (62 miles) per hour in a four-day race through Australia's desert Outback. We hear the word "Carbon" everywhere these days, but what exactly is it? 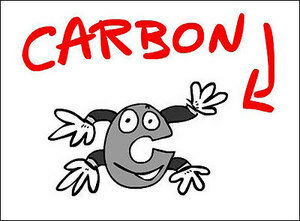 How is Carbon different from Carbon Dioxide? Perhaps you feel embarrassed to even ask. Here is good news for you then. NPR has a five-part animation series that explains what Carbon is and how it is affecting the environment.